President Richard Nixon's farewell speech to White House staff on the morning of August 9, 1974, after his resignation was announced shortly before it became effective. On May 9, 1972, Representative William Fitts Ryan (D-NY) submitted a resolution, H.Res. 975, to impeach President Nixon. The resolution was referred to the Judiciary Committee. The next day, Representative John Conyers (D-MI) introduced a similar resolution, H.Res. 976. On May 18, 1972, Conyers introduced his second resolution, H.Res. 989, calling for President Nixon's impeachment. The resolutions were referred to the Judiciary Committee, where they did not progress. These actions occurred before the break-in at the Watergate complex. Representative Robert Drinan (D-MA) on July 31, 1973, introduced a resolution calling for the impeachment of Nixon, though not for the Watergate scandal. Drinan believed that Nixon's secret bombing of Cambodia was illegal, and as such, constituted a "high crime and misdemeanor". The resolution was received with little enthusiasm by the House Democratic leadership. As the House Majority Leader, Tip O'Neill, later stated, "Morally, Drinan had a good case. But politically, he damn near blew it. For if Drinan's resolution had come up for a vote at the time he filed it, it would have been overwhelmingly defeated – by something like 400 to 20. After that, with most of the members already on record as having voted once against impeachment, it would have been extremely difficult to get them to change their minds later on." The Watergate scandal began with the June 17, 1972, break-in at the Democratic National Committee headquarters at the Watergate office complex in Washington, D.C., and the Nixon administration's attempted cover-up of its involvement. When the conspiracy was discovered and investigated by the United States Congress, the Nixon administration's resistance to its probes led to a constitutional crisis. Secretary of State Henry Kissinger, President Nixon, Vice Presidential nominee Gerald Ford, and White House Chief of Staff Alexander Haig, in October 1973. Kissinger and Haig would play large roles in running the government as impeachment loomed during the final stages of the Nixon presidency. By September 1973, there was a sense that Nixon had regained some political strength, the American public had become burned out by the Watergate hearings, and that Congress was not willing to undertake impeachment absent some major revelation from the Nixon White House tapes or some major new action by the president against the investigation. There was sufficient interest in impeachment possibilities during these months, however, that the House Judiciary Committee put together a 718-page historical collection of often hard-to-find Congressional and previously published scholarly material on impeachment. Published on October 9, 1973, the Foreword stated, "In recent months, the Committee on the Judiciary has daily received numerous requests for information regarding the constitutional and procedural bases for the impeachment of [officials]. ... "
Demonstrators in Washington demanding that Congress impeach President Nixon, two days after the "Saturday Night Massacre"
After Nixon fired Watergate Special Prosecutor Archibald Cox, which led to the immediate departures of Attorney General Elliot Richardson and Deputy Attorney General William Ruckelshaus in what became known as the "Saturday Night Massacre" of October 20, 1973, however, momentum towards impeachment grew rapidly. (In the view of Nixon speechwriter Pat Buchanan, who had been privy to Nixon's thinking, the president had known this would be the likely outcome of dismissing Cox.) 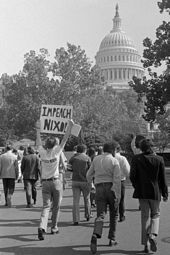 On October 23, 1973, a landslide of resolutions calling for impeachment, impeachment investigations, and appointment of a special prosecutor were introduced against Nixon. The introduction of these resolutions continued for several days, but the Judiciary Committee was reluctant to start a formal investigation, especially with the Vice Presidency vacant after the resignation amid scandal of Spiro Agnew on October 10, 1973. Congressional Democrats found themselves under considerable pressure to hold hearings on Nixon's alleged abuse of presidential powers. Representative Peter W. Rodino of New Jersey, a Democrat, had only been Judiciary Chairman for a few months when his committee began to hear the case for Nixon's impeachment. Until the Watergate scandal, Rodino had spent his political career largely below the radar screen. Watergate put Rodino front and center in the political limelight. "If fate had been looking for one of the powerhouses of Congress, it wouldn't have picked me," Rodino told a reporter at the time. But Speaker Albert thought Rodino and his committee had done a fair and thorough job during the confirmation hearings for the vice-presidential nomination of Gerald Ford as Agnew's replacement, and Albert was content for all the impeachment resolutions to go through the Judiciary Committee. Over the next two months, as the impeachment investigations began, there was speculation in Washington that Nixon might resign. Despite several attempts to do so, Nixon had not been able to put Watergate behind him, and the momentum of events was against him. At one point during November 1973 he felt forced to say, "People have got to know whether or not their President is a crook. Well, I'm not a crook." There were rumors in Washington that Nixon was in poor mental and physical shape; in December 1973 Senator Barry Goldwater wrote a private note that said, "I have reason to suspect that all might not be well mentally in the White House. This is the only copy that will ever be made of this; it will be locked in my safe." The Judiciary Committee set up a staff, the Impeachment Inquiry staff, to handle looking into the charges, that was separate from its regular Permanent staff. Based upon the recommendations of many in the legal community, John Doar, a well-known civil rights attorney in the Kennedy and Johnson administrations who was a long-time Republican turned Independent, was hired by Rodino in December 1973 to be the lead special counsel for the Impeachment Inquiry staff. Doar shared with Rodino a view that the Senate hearings had gone overboard with leaked revelations and witnesses compelled to testify under immunity grants; they were determined to do things in a more thorough and objective process. Albert E. Jenner, Jr. was named in January 1974 as top counsel on the Impeachment Inquiry staff for the Republican minority on the committee. Attorney Sam Garrison, who had been an aide to Vice President Agnew, also joined the minority legal staff following Agnew's resignation. With public pressure growing, the House passed a resolution on February 6, 1974, giving formal authority to its Judiciary Committee to launch an impeachment inquiry against the president. As part of the discussion over this measure, which was not a measure of actual impeachment sentiment and which passed by a 410–4 vote, Rodino said, "Whatever the result, whatever we learn or conclude, let us now proceed with such care and decency and thoroughness and honor that the vast majority of the American people, and their children after them, will say: This was the right course. There was no other way." House Republican leader John J. Rhodes said that Rodino's vow was "good with me". In March 1974, the D.C. grand jury that had been involved in the case since the original 1972 indictments against the Watergate burglars, handed up its most significant indictments in the case, including Haldeman, Ehrlichman, Mitchell, and others. Because prosecutors informed the grand jury that the Constitution likely prohibited the indictment of an incumbent president, with impeachment thus the only recourse, the jurors recommended that materials making a criminal case against President Nixon be turned over to the House Judiciary Committee. These materials, which had been prepared by the Special Prosecutor Leon Jaworski, consisted of a 55-page index that enumerated testimony, tapes, and other items of evidence, but omitted legal analysis and offered no conclusions regarding whether there were impeachable actions in Nixon's behaviors. Jaworski's action, which was an unprecedented move to get around his own legal inability to hand materials directly to Congress, was challenged in federal court but upheld. These materials, which became known as the "Road Map", played a key role in guiding the House Judiciary Committee. Held under seal, they have remained secret as of 2018[update] (when they became discussed in a similar but more current context). A federal judge ordered a partial release of the materials on October 11, 2018. Additionally, the grand jury in fact named Nixon as an "unindicted co-conspirator" in a sealed addendum to their indictments of Nixon's aides. News of this March 1 action was not revealed to the public until a June 6 report in the Los Angeles Times. Acquisition of the White House tapes became the key factor in the investigation. Both Rodino and Doar felt that the existing case against Nixon consisted mostly of broad practices of abuse on the part of the administration, but was lacking in specific items that could be tied to direct presidential knowledge or actions. For this, they needed the tapes. Nixon released edited transcripts of White House tapes on April 29, 1974, in an attempt to defuse the demand for the tapes. On April 11, 1974, by a 33–3 vote, the Judiciary Committee subpoenaed 42 White House tapes of key conversations. A week later, Jaworski also placed subpoenas for tapes, in this case for 64 additional recordings. Nixon initially wanted to refuse these requests completely, but St. Clair and other aides said such a stance of complete concealment would not be tenable politically; instead Nixon and his staff embarked on an approach of partial turnover with certain passages edited or removed. Nixon thus ordered transcripts of the tapes to be prepared. After a cursory inspection of the transcripts, Nixon, shocked at viewing several profanity-laced discussions amongst the White House's inner-circle, ordered that every use of profanity be replaced by "[EXPLETIVE DELETED]". On April 29, President Nixon appeared on national television to state that he was giving to the Judiciary Committee edited transcripts of the conversations they wanted. Some 1,250 pages of transcripts were made public on April 30, the following day. But the president refused to hand over requested tapes and other documents to Jaworski. Of what was released, Nixon conceded some of it would be embarrassing to him and his administration. Nevertheless, he said that although there were some ambiguous passages, the transcripts as a whole would "tell it all" and vindicate his narrative of his actions in Watergate. The Judiciary Committee, however, rejected Nixon's edited transcripts, saying that they did not comply with the terms of the subpoena. The transcripts themselves quickly dominated the news and even popular culture landscape. A few newspapers printed the transcripts in full, and two quickly produced paperbacks contained the same, resulting in sale of over a million copies. There were broadcasts on radio and television in which actors played out the transcript, taking the parts of Nixon and the key aides. The phrase "expletive deleted" entered the pop lexicon, found innumerable humorous uses, and soon became a catchphrase of Watergate. Most of all, the transcripts represented a turning point in support for the president, with the crudity of what was revealed beginning the erosion of support among Republicans. Talk of possible impeachment included considerations of how it might affect U.S. foreign relations. During the spring of 1974, U.S. Secretary of State Henry Kissinger publicly proclaimed his expectation that the president would neither be impeached nor resign, but privately he worried that the country's ability to deal with foreign problems would be significantly damaged by an impeachment. Kissinger later said this fear manifested itself during Strategic Arms Limitation Talks (SALT II) negotiations in April 1974, when the Soviet Union's Foreign Minister, Andrei Gromyko, asked him how the U.S. government would function if impeachment came to pass. Kissinger assessed that the Politburo was unlikely to extend concessions given the uncertainty. As the impeachment process went on, Nixon attempted to get past it with a pair of diplomatic trips. Here with President of Egypt Anwar Sadat and their wives in June 1974. 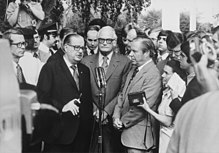 Nixon attempted to showcase the presidential aspect of being in his foreign policy element during this time, traveling to the Middle East in June 1974, going in particular to Egypt where he met with President Anwar Sadat, where Nixon was cheered by millions as a result of Kissinger's shuttle diplomacy earlier that year. Unknown to the public at the time, Nixon was suffering a potentially fatal case of phlebitis. 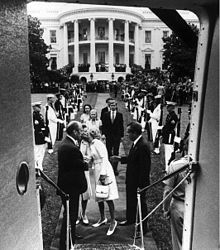 White House doctors reportedly tried to persuade Nixon to forego the trip, but he insisted; some Secret Service agents even thought Nixon was deliberately courting death by insisting on going, believing that dramatic end preferable to suffering further Watergate troubles and possible impeachment. Nixon then went to a summit meeting with the Soviet Union in Moscow. The White House tried to portray these trips as his presidency having "turned the corner" from Watergate and the impeachment process. There were six special elections for House seats during 1974 that supplied a measure of voter sentiment regarding Watergate; Democratic candidates won five of them. One such turn was in Michigan's 5th congressional district, which Gerald Ford had long held before being appointed Vice President. Another special election was in Michigan's 8th congressional district, a traditionally Republican district. Nixon campaigned for the Republican candidate, but in small towns only, to avoid demonstrations. The Democratic candidate's win in April 1974 was widely seen as a political defeat for the president. Most impactful of all, the special election results told Republicans on the Judiciary Committee that it would be possible for them to vote for Nixon's impeachment without suffering a political penalty at the ballot box. The Impeachment Inquiry staff hired 34 counsels reporting to Doar or the other senior lawyers on the staff. One who later became well-known was William Weld. He worked on researching case law regarding what constituted grounds for impeachment. He also worked on studying whether impoundment of appropriated funds was an impeachable offense. Another was Hillary Rodham. Under the guidance of Doar and Nussbaum, Rodham helped research procedures of impeachment and, like Weld, the historical grounds and standards for impeachment. As part of this she wrote a brief supporting Rodino's belief that during initial evidentiary hearings to determine whether potential grounds for impeachment exist, the target of the possible impeachment has no right to representation by counsel at the hearings. Altogether there were 44 lawyers on the staff, of whom only 3 were women, and close to a 100 total people when researchers, clerks, typists, and other support personnel were enumerated. The committee staffers generally worked long, sometimes tedious hours. Rodham and some of the other women on the staff had to post a sign telling the male staffers that they were not there to make coffee for them. The committee spent eight months gathering evidence and pushed Nixon to comply with a subpoena for conversations taped in the Oval Office. Its quarters were in the old Congressional Hotel, which had become the O'Neill House Office Building. Security guards patrolled the halls and the work was done in rooms with closed blinds. The case was put together on more than 500,000 five-by-seven-inch notecards that were cross-indexed against each other. Mastering this filing system became a requirement of anyone working on the inquiry. Doar ran a regimented ship and insisted that everyone be neat and orderly in their process; in a typically humorless instance, he told a staffer who had broken a filekeeping rule that "The greatest tribute to a man would be that if he died someone could come into his office the next day and pick up where he left off." A constant worry among committee leaders was that developments from their research, deliberations, and preliminary conclusions would leak to the press; Doar in particular had the junior lawyers on the inquiry working on isolated areas so that only a few of the senior counsels knew the big picture. Opinions differ as to how successful they were at preventing leaks, with some saying they were and some saying they were not. The House Judiciary Committee opened its formal impeachment hearings against the President on May 9, 1974. The first twenty minutes were televised on the major U.S. networks, after which the committee switched to closed sessions for the next two months. At the time of the initial impeachment investigations, it was not known if Nixon had known and approved of the payments to the Watergate defendants earlier than this conversation. Nixon's conversation with Haldeman on August 1, 1972, is one of several that establishes this. Nixon states: "Well ... they have to be paid. That's all there is to that. They have to be paid." During the congressional debate on impeachment, some believed that impeachment required a criminally indictable offense. President Nixon's agreement to make the blackmail payments was regarded as an affirmative act to obstruct justice. Impoundment of appropriated funds, related to funds allocated by Congress that Nixon chose not to spend because he did not like the associated goals – in particular, for the Clean Water Act – was also considered by the impeachment inquiry. However the staff decided that, even though some courts had ruled such impoundments illegal, it was not an impeachable offense. Consequently, no article along these lines was brought up for a committee vote. On July 9, the Judiciary Committee released its own version of eight of the White House tapes that Nixon had previously issued his own transcript of. The Committee transcripts were both the beneficiary of superior playback equipment and restored some of the potentially damaging statements that Nixon staffers had removed or heard differently. This was quickly followed by the July 12 Committee release of its accumulated evidence on the case, which ran to 3,888 pages. For the first time, St. Clair acknowledged publicly that a committee vote in favor of impeachment was likely, but Press Secretary Ziegler said that the president remained confident that the full House would not impeach. Ray Thornton of Arkansas, William L. Hungate of Missouri, and Jack Brooks of Texas were part of a group of three southern Democrats and four moderate Republicans who drafted the articles of impeachment adopted by the Committee. Nixon later called Brooks his "executioner". During the hearings, President Nixon attempted to preserve his support in the House by wooing senior figures there, including some conservative Democrats, by inviting them to White House functions or evening cruises on the presidential yacht USS Sequoia. The televised coverage of committee hearings resumed on July 24. The commercial broadcast networks televised the evening sessions while PBS broadcast the morning and afternoon sessions as well; this was after considerable debate about whether such broadcasts were a good idea. The first broadcast was an evening session of the committee on the evening of the 24th and started two days of televised opening-statements by committee members. In total there were six days of 13 hours-per-day of televised coverage, watched by millions of Americans. On the afternoon of Friday, July 26, television viewers watched live as the first Article of Impeachment was read into the record against the President. On July 25, 1974, Texas Democrat Barbara Jordan delivered a fifteen-minute televised speech before the House Judiciary Committee supporting the impeachment process. Jordan's statement on the articles of impeachment is thought to be one of the best speeches of the 20th century and earned Jordan national praise for her rhetoric, morals, and wisdom. Democratic Representative Walter Flowers of Alabama, a conservative Democrat, was considered to be leaning against impeachment. After a long struggle, which caused an ulcer to recur, Flowers indicated he would vote for impeachment. The congressman said "I felt that if we didn't impeach, we'd just ingrain and stamp in our highest office a standard of conduct that's just unacceptable." Coming from a state which had supported Nixon in 1972, he was seen as influential even with some Republicans. He told the undecided Republicans on the committee, "This is something we just cannot walk away from. It happened, and now we've got to deal with it. Republican Representative M. Caldwell Butler of Virginia explained his vote in favor of impeachment by saying, "For years we Republicans have campaigned against corruption and misconduct. ... But Watergate is our shame." Representative Lawrence Hogan of Maryland, another Republican, said, "After reading the transcripts, it was sobering: the number of untruths, the deception and the immoral attitudes. By any standard of proof demanded, we had to bind him over for trial and removal by the Senate." After much internal and external anguish, Representative Tom Railsback also decided to vote in that direction. Representative Elizabeth Holtzman of New York, a young Democrat, also drew national media attention as a member of the committee. Another representative from New York, Charles Rangel, became a force in the House in subsequent years. Rangel had a more positive take on what transpired: "Some say this is a sad day in America's history. I think it could perhaps be one of our brightest days. It could be really a test of the strength of our Constitution, because what I think it means to most Americans is that when this or any other President violates his sacred oath of office, the people are not left helpless." As a member of the Judiciary Committee, Drinan, who had introduced the earlier resolutions, also played a role in the Congressional investigation of Nixon administration misdeeds and crimes and gained national visibility as a consequence. One of the arguments that Nixon supporters on the committee often made was that the charges and the questions being asked about them needed more "specificity". In that respect they challenged those who would impeach to come up with more details in purposeful conversations to be linked together as part of a concerted plan of action. Republican Charles E. Wiggins of California was Nixon's fiercest and ablest defender on the committee. Wiggins consistently argued that no specific piece of evidence directly linked Nixon to any criminal act. Other prominent defenders included David W. Dennis of Indiana and Delbert L. Latta of Ohio. Republican Charles W. Sandman, Jr. of New Jersey defended Nixon throughout the proceedings, often to the point of caustic stridency, and gained brief national visibility as a result. The New York Times described him as: "a heavyset man with glasses on the end of his nose, a pencil grasped between his hands, heaping sarcasm and scorn upon the arguments of those who would impeach the President". He was one of those most vocally demanding "specificity". At one point during the hearings, Sandman angrily told his New Jersey colleague on the committee, Chairman Rodino, "Please, let us not bore the American public ... you have your 27 votes", referring to the 27 affirmative votes for the first article of impeachment against Nixon. Sandman denied that emotion was the key behind his defense, saying "My role is not one of defending the President – that's for sure. I believe in a strict construction of the Constitution. If somebody, for the first time in seven months, gives me something that is direct, I will vote to impeach." Attorney James D. St. Clair, having been named a special counsel to the president in January 1974, represented Nixon before the House Judiciary Committee as they considered the impeachment charges against him. He said in explanation of his role, "I don't represent Mr. Nixon personally. I represent him in his capacity as president." This dovetailed with Nixon's argument that he was motivated by a desire to protect the presidency and not by any urge for self-preservation. St. Clair's defense was centered around the notion that while Nixon had made a number of statements that looked bad, he had committed no crimes. There was tension between the two minority counsels, Jenner and Garrison, as Garrison had firmer ties to the conservative Republicans on the committee. Once Jenner came out in favor of impeachment, saying the evidence for it was persuasive, he was removed from his role as the minority's chief special counsel. Garrison was chosen to replace him on July 22, and had to put together on a last-minute basis his own defense of the president. Garrison later said that the stress of his position caused him to collapse from anxiety at one point. Shortly before the committee undertook its impeachment votes, a Harris Poll showed that 53 percent of Americans supported an impeachment of Nixon by the House. The same poll showed that 47 percent thought he should be convicted in a Senate trial, 34 percent thought he should be acquitted, and the rest were unsure. A Gallup Poll taken around the same time revealed that Nixon's favorability rating had fallen to 24 percent. These hearings culminated in votes on proposed articles of impeachment. As the Judiciary Committee prepared for the votes, Rodino said: "We have deliberated. We have been patient. We have been fair. Now the American people, the House of Representatives and the Constitution and the whole history of our republic demand that we make up our minds." The Judiciary Committee, with six Republicans joining the Democratic majority, passed three of the five proposed articles of impeachment. On July 27, 1974, the Committee voted 27–11 to recommend the first article of impeachment against the president: obstruction of justice. The Committee then recommended the second article, abuse of power, on July 29, 1974. The next day, on July 30, 1974, the Committee recommended the third article: contempt of Congress. repeatedly engaged in conduct violating the constitutional rights of citizens, impairing the due and proper administration of justice and the conduct of lawful inquiries, or contravening the laws governing agencies of the executive branch and the purposes of these agencies. failed without lawful cause or excuse to produce papers and things as directed by duly authorized subpoenas issued by the Committee on the Judiciary of the House of Representatives on April 11, 1974, May 15, 1974, May 30, 1974, and June 24, 1974, and willfully disobeyed such subpoenas. Notwithstanding the fact that I was Democrat, notwithstanding the fact that there were many who thought that Rodino wanted to bring down a president as a Democrat, you know, he was our president. And this is our system that was being tested. And here was a man who had achieved the highest office that anyone could gift him with, you know. And you're bringing down the presidency of the United States, and it was a sad, sad commentary on our whole history and, of course, on Richard Nixon. The Committee voted 12–26 against including the administration's falsification of records concerning the secret bombing of Cambodia in the articles of impeachment leveled against President Nixon. Another article, regarding Nixon's personal finances and failure to pay taxes, was also not passed. The three articles of impeachment that the Judiciary Committee did vote to the floor of the House represented the furthest an impeachment proceeding against a president had progressed in over a century. Even with support diminished by the continuing series of revelations, Nixon hoped to fight the impeachment charges. He was closely studying the possible vote counts that impeachment in the House or trial in the Senate would get; Kissinger later sympathetically described the president at this time as "a man awake in his own nightmare". Republican leaders in Congress were also estimating vote counts: during a July 29 private meeting between House Minority Leader John Rhodes and Senate Minority Leader Hugh Scott, Rhodes estimated that impeachment in the House would get as many as 300 votes, well more than the majority of 218 it needed, and Scott felt that there were 60 votes for conviction in the Senate, a little short of the two-thirds of 100 it needed. Both felt that the situation was deteriorating for the president. According to Senator Jacob Javits, a Senate trial was not likely to start before November 1974 and might run to late January 1975 before there was a verdict. The House and Senate both agreed to full television coverage of each chamber's proceedings, and technical preparations and discussions of specific ground rules were underway. Because Nixon might be forced to be in attendance during the Senate proceeding, Kissinger came up with plans to form a small group to manage the government in the president's place, to be composed of a few top Cabinet officers and Congressional leaders as well as White House Chief of Staff Alexander Haig. However, while all this had been in motion, on July 24, the Supreme Court had ruled unanimously in United States v. Nixon that the full Nixon White House tapes, not just selected transcripts, must be released. As a consequence, on August 5, 1974, the White House released a previously unknown audio tape from June 23, 1972. Recorded only a few days after the break-in, it documented the initial stages of the coverup: it revealed Nixon and aide H. R. Haldeman meeting in the Oval Office and formulating a plan to block investigations by having the CIA falsely claim to the FBI that national security was involved. This demonstrated both that Nixon had been told of the White House connection to the Watergate burglaries soon after they took place, and that he had approved plans to thwart the investigation. In a statement accompanying the release of what became known as the "Smoking Gun" Tape, Nixon accepted blame for misleading the country about when he had been told of White House involvement, stating that he had a lapse of memory. Initially Nixon said he would not step down but rather that the process defined by the Constitution should play out. The release of the "smoking gun" tape dealt a fatal blow to Nixon's public defense of his actions in Watergate over two years, and it destroyed Nixon politically. Representative Wiggins in particular dropped his support for Nixon after the revelation of this tape, saying later on August 5 that "the facts then known to me have now changed," and that it was now obvious Nixon had a "plan of action" to cover up the break-in. He believed that as a result, "these facts standing alone are legally sufficient in my opinion to sustain at least one count against the President of conspiracy to obstruct justice." However, Wiggins said he would vote against the other articles, arguing that they would "constitute unfortunate historical precedents if allowed to stand." The importance of Wiggins, who had been Nixon's ablest defender in committee, was emphasized by The New York Times front-page headline the next day: "Wiggins for Impeachment; Others in G.O.P. Join Him". The ten representatives who voted against all three articles of impeachment in the House Judiciary Committee all gave indication that they would vote to impeach Nixon for obstruction of justice when the vote was taken in the full House. These included staunch supporters such as Sandman, Dennis, and Latta. In his remarks, Dennis said that the president had "destroyed his credibility" with his defenders on the committee. Along similar lines, Latta said that it was clear that "we certainly weren't given the truth." Minority Leader Rhodes also announced he would support impeachment, saying that while he admired Nixon's accomplishments, "coverup of criminal activity and misuse of federal agencies can neither be condoned nor tolerated." According to Rhodes' obituary in the Post, the decision of the House leader of Nixon's own party to publicly break from him was the "coup de grace for the Nixon presidency." During the late afternoon of August 7, 1974, Senators Goldwater and Scott and Representative Rhodes met with Nixon in the Oval Office and told him that his support in Congress had all but disappeared. Rhodes told the president that he would face certain impeachment when the articles came up for vote in the full House. For example, by Majority Leader O'Neill's estimate, no more than 75 representatives were willing to vote against the obstruction-of-justice article. Goldwater and Scott told the president that there were not only enough votes in the Senate to convict him, but that no more than 15 or so Senators were willing to vote for acquittal – far fewer than the 34 he needed to avoid removal from office. They did not pressure Nixon to resign, but simply made the realities of the situation clear. Goldwater later wrote that as a result of the meeting, Nixon "knew beyond any doubt that one way or another his presidency was finished". With impeachment by the House and removal by the Senate all but certain, on the night of August 8, 1974, Nixon took to the airwaves and delivered an address in which he announced his decision to resign the following morning. At 11:35 AM EST on August 9, 1974, Nixon officially became the first, and so far only, president to resign. August 9, 1974, White House South Lawn: President Nixon and his wife are about to board the helicopter to take them away. Vice President Gerald Ford, left, less than an hour after this moment, became President following Nixon's resignation becoming effective. Nixon proclaimed his innocence until his death in 1994. In his official response to the pardon, he said that he "... was wrong in not acting more decisively and more forthrightly in dealing with Watergate, particularly when it reached the stage of judicial proceedings and grew from a political scandal into a national tragedy". The legacies of several of the House Judiciary Committee members were affected by the impeachment process. Wiggins's advocacy for Nixon almost cost him reelection in 1974. He was elected one more time before retiring from Congress. Sandman's reputation was severely tarnished by his performance in the televised hearings. He was soundly defeated by Democrat William J. Hughes, his opponent in 1974, and never returned to Congress. ^ Stathis, Stephen W.; Huckabee, David C. (September 16, 1998). "Congressional Resolutions on Presidential Impeachment: A Historical Overview" (PDF). CRS Report for Congress. Congressional Research Service – Library of Congress. p. 14. Retrieved December 30, 2016. ^ Marjorie Hunter (August 1, 1973). "House Gets Impeach‐Nixon Resolution". The New York Times. p. 23. ^ a b "Rev. Drinan, first priest elected as voting member of Congress, dies " The Boston Globe January 28, 2007. ^ Samson, William (2005). "President Nixon's Troublesome Tax Returns". TaxAnalysts. Retrieved December 20, 2013. ^ R. W. Apple, Jr. (1973). "'There Was a Cancer Growing on the Presidency ... '". In Staff of The New York Times (ed.). The Watergate Hearings: Break-in and Cover-up. Bantam Books. pp. 61–65. ^ Impeachment: Selected Materials. Committee on the Judiciary, House of Representatives, 93rd Congress, First Session, U.S. Government Printing Office. October 1973. p. iii. ^ Walker, Samuel (1990), In Defense of American Liberties: A History of the ACLU, Oxford University Press, ISBN 0-19-504539-4, pp. 292–294. The ACLU published a full page newspaper advertisement on October 14, 1973, urging impeachment. ^ Reed, Roy (January 9, 2009). "Charles Morgan Jr., 78, Dies; Leading Civil Rights Lawyer". The New York Times. Retrieved November 3, 2013. ^ Reeves, President Nixon, p. 605. ^ Woodward, Bob; Bernstein, Carl (1976). The Final Days. New York: Avon Books. p. 60. ^ a b c Shipkowski, Bruce (May 8, 2005). "Peter Rodino Jr., 96; led hearing on Nixon impeachment". Associated Press. Retrieved January 15, 2015. ^ a b c d e Woodward and Bernstein, The Final Days, pp. 111–112. ^ Naughton, James M. (October 31, 1973). "House Panel Starts Inquiry On Impeachment Question" (PDF). The New York Times. pp. 1, 30. ^ Woodward and Bernstein, The Final Days, pp. 98–99. ^ a b c d e Joan E. Greve (August 5, 2014). "What Richard Nixon's Impeachment Looked Like". Time. ^ Reeves, President Nixon, p. 606. ^ "Advocates; Should The President Be Impeached?". Open Vault at WGBH. January 3, 1974. Retrieved September 19, 2016. ^ Henry Kissinger (1982). Years of Upheaval. Boston: Little, Brown and Company. pp. 804–805. ^ Kissinger, Years of Upheaval, p. 914. ^ a b c Mikkelson, David (October 21, 2014). "Zeif-geist". Snopes.com. Updated July 6, 2016. ^ "Man in the News: A Hard‐Working Legal Adviser: John Michael Doar". The New York Times. December 21, 1973. p. 20. ^ Farrel, William E. (January 25, 1974). "Man in the News: G.O.P. Aide in Inquiry" (PDF). The New York Times. p. 17. ^ a b Patricia Sullivan (May 31, 2007). "Watergate GOP Counsel, Gay Activist Sam Garrison". The Washington Post. p. B06. ^ a b c d Kessler, Glenn (September 6, 2016). "The zombie claim that Hillary Clinton was fired during the Watergate inquiry". The Washington Post. ^ a b Bernstein, A Woman in Charge, p. 95. ^ "Notable deaths in the Washington area: Emanuel Raymond Lewis, U.S. House librarian". The Washington Post. June 20, 2014. ^ Naughton, James M. (February 7, 1974). "House, 410–4, Gives Supboena Power in Nixon Inquiry". The New York Times. pp. 1, 22. ^ Carl Bernstein; Bob Woodward (1974). All the President's Men. New York: Warner Paperback Library. pp. 366–367. ^ a b c d Charlie Savage, "Legal Experts Urge Release of Watergate Report to Offer Mueller a Road Map", The New York Times, September 15, 2018, p. A1. ^ "Judge orders partial release of Watergate 'road map'". Retrieved 12 October 2018. ^ a b c d e Reeves, President Nixon, p. 608. ^ Woodward and Bernstein, The Final Days, pp. 116–119. ^ a b Woodward and Bernstein, The Final Days, p. 123. ^ Woodward and Bernstein, The Final Days, pp. 123ff. ^ Woodward and Bernstein, The Final Days, p. 514. ^ a b James Wieghart (April 30, 1974). "President Richard Nixon announces release of transcripts of Watergate tapes". New York Daily News. ^ Woodward and Bernstein, The Final Days, p. 148. ^ Jack W. Germond, Fat Man in a Middle Seat: Forty Years of Covering Politics (New York: Random House, 1999), pp. 119–120. ^ Marvin Kalb; Bernard Kalb (1974). Kissinger. Boston: Little, Brown and Company. p. 547. ^ Kissinger, Years of Upheaval, pp. 1025–1026. ^ Harold M. Schmeck Jr. (July 10, 1974). "300,000 in U.S. Have Phlebitis, Affliction of Nixon and Franco". The New York Times. p. 2. ^ John Chancellor (March 26, 1976). "Nixon / Final Days In White House". NBC Evening News – via Vanderbilt Television News Archive. ^ Jack W. Germond, Fat Man in a Middle Seat: Forty Years of Covering Politics (New York: Random House, 1999), pp. 115, 117. ^ a b Tom Wicker (April 17, 1974). "Michigan Democrat Wins In Election for House Seat". The New York Times. p. 1. ^ Jack W. Germond, Fat Man in a Middle Seat: Forty Years of Covering Politics (New York: Random House, 1999), pp. 116–117. ^ Jack W. Germond, Fat Man in a Middle Seat: Forty Years of Covering Politics (New York: Random House, 1999), p. 117. ^ a b c d e f Naftali, Timothy (September 28, 2011). "An Oral History Interview with William Weld" (PDF). Richard Nixon Presidential Library and Museum. pp. 1, 3, 5, 6. Weld misremembers some of the facts of the matter and the interviewer corrects him in places. ^ a b Bernstein, Carl (2007). A Woman in Charge: The Life of Hillary Rodham Clinton. New York: Alfred A. Knopf. ISBN 0-375-40766-9. , pp. 94–96, 101–103. ^ Bernstein, A Woman in Charge, p. 75. ^ a b c Bernstein, A Woman in Charge, p. 96. ^ Bernstein, A Woman in Charge, pp. 98–99. ^ a b Wood, Anthony R.; Horvitz, Paul (May 8, 2005). "Ex-congressman Peter Rodino, 95, dies The N.J. Democrat headed impeachment hearings that led Nixon to resign". The Philadelphia Inquirer. Retrieved January 15, 2015. ^ a b Bernstein, A Woman in Charge, pp. 101–102. ^ a b c "Watergate Figure Peter Rodino Dies". All Things Considered. NPR. May 8, 2005. ^ Woodward and Bernstein, The Final Days, pp. 167, 247. ^ "Impeachment Proceedings Against President Nixon". United States Government Publishing Office. Retrieved 2015-07-28. ^ "Nixon's Clean Water Act Impoundment Power Play". The Huffington Post. May 22, 2012. ^ "Impoundment May Not Be Impeachable Offense". The Decatur Daily Review. Associated Press. July 30, 1974. p. 1. ^ Woodward and Bernstein, The Final Days, pp. 254–255. ^ a b Woodward and Bernstein, The Final Days, p. 269. ^ Cahn, Emily (December 5, 2012). "Jack Brooks of Texas Dies at 89". CQ Roll Call. ^ Jack W. Germond, Fat Man in a Middle Seat: Forty Years of Covering Politics (New York: Random House, 1999), pp. 118–119. ^ a b Garay, Ronald. "Watergate". Museum of Broadcast Communications. ^ a b c Garay, Ronald (2014). "Watergate". In Newcomb, Horace (ed.). Encyclopedia of Television. Taylor & Francis. pp. 2491–2492. ISBN 978-1-135-19479-6. ^ a b "Barbara C. Jordan". History.com. 2009. Retrieved May 7, 2015. ^ a b c d "The Fatal Vote to Impeach". Time. 1974-08-05. Retrieved 2007-06-22. ^ Jack W. Germond, Fat Man in a Middle Seat: Forty Years of Covering Politics (New York: Random House, 1999), pp. 117–118, 120–121. ^ Holtzman, Elizabeth. "Elizabeth Holtzman". The Huffington Post. ^ a b Woodward and Bernstein, The Final Days, p. 320. ^ a b Pace, Eric (March 8, 2000). "Charles Wiggins, 72, Dies; Led Nixon's Defense in Hearings". The New York Times. ^ a b c d e f Rosenbaum, David E. (August 6, 1974). "Wiggins for Impeachment; Others in G.O.P. Join Him". The New York Times. p. 1. ^ a b c Kerr, Peter (August 27, 1985). "Ex-Rep. Charles Sandman, Nixon Supporter, Dies". The New York Times. ^ a b c Robert Pear (March 12, 2001). "James St. Clair, Nixon's Watergate Lawyer, Is Dead at 80". The New York Times. p. B7. ^ "Albert E. Jenner, 81, A Watergate Counsel". The New York Times. September 20, 1988. Retrieved July 26, 2017. ^ Samuel Alexander Garrison 3d (July 23, 1974). "G.O.P. Counsel on Impeachment". The New York Times. p. 27. ^ a b Mike Allen; Amanda Codispoti (May 31, 2007). "Lawyer relished role as activist: Gay rights topped the list of Sam Garrison's causes during a career with its share of ups and downs". Roanoke Times. Archived from the original on September 9, 2012. ^ Crapanzano, Vincent (2000). Serving the Word: Literalism in America from the Pulpit to the Bench. New York: The New Press. pp. 246–251. ISBN 1-56584-673-7. ^ a b The Washington Post, Nixon Resigns. ^ a b Naughton, James M. (July 28, 1974). "A Historic Charge". The New York Times. p. 1. ^ a b Naughton, James M. (July 30, 1974). "New Accusation". The New York Times. p. 1. ^ a b c "Excerpts From Transcript of the Proceedings on Impeachment" (PDF). The New York Times. July 31, 1974. p. 14. ^ Naughton, James M. (July 31, 1974). "House Panel, 21 to 17, Charges Nixon with Defying Subpoenas" (PDF). The New York Times. p. 1. ^ a b c "Articles of Impeachment". watergate.info. ^ Kissinger, Years of Upheaval, p. 1181. ^ Woodward and Bernstein, The Final Days, pp. 330–331. ^ a b Kissinger, Years of Upheaval, pp. 1193–1194. ^ Ambrose, Stephen E. (1991). Nixon: Ruin and Recovery 1973–1990. New York: Simon & Schuster. pp. 394–395. ISBN 978-0-671-69188-2. .
^ "TRANSCRIPT OF A RECORDING OF A MEETING BETWEEN THE PRESIDENT AND H.R. HALDEMAN IN THE OVAL OFFICE ON JUNE 23, 1972" (PDF). Archived (PDF) from the original on 2016-07-29. ^ Ambrose, Nixon, pp. 414–416. ^ a b Katharine Graham, Personal History (New York: Alfred A. Knopf, 1997), p. 495. ^ Richard Reeves, President Nixon: Alone in the White House (New York: Simon & Schuster, 2007, paperback ed. ), p. 609. ^ "Statement by Wiggins on Support of Impeachment". The New York Times. August 6, 1974. p. 17. ^ a b Barnes, Bart (August 26, 2003). "John J. Rhodes Dies; Led GOP In House During Watergate". The Washington Post. ^ a b c Woodward and Bernstein, The Final Days, pp. 459–463. ^ Black, Conrad (2007). Richard M. Nixon: A Life in Full. New York: PublicAffairs Books. p. 978. ISBN 978-1-58648-519-1. .
^ Mary Lou Fulton (1990-07-17). "Nixon Library: Nixon Timeline-Page 2". Los Angeles Times. ^ Kaufman, Michael T. "Peter W. Rodino Dies at 96; Led House Inquiry on Nixon", The New York Times, May 8, 2005. Accessed November 25, 2007. "Peter W. Rodino Jr., an obscure congressman from the streets of Newark who impressed the nation by the dignity, fairness, and firmness he showed as chairman of the impeachment hearings that induced Richard M. Nixon to resign as president, died yesterday at his home in West Orange, N.J. He was 95." ^ a b "Stateswoman Barbara Jordan – A Closeted Lesbian". Planet Out. Archived from the original on December 14, 2007. Retrieved July 12, 2007. ^ "Voters Turn Backs on Nixon Supporters". The Milwaukee Journal. November 6, 1974. Retrieved 2010-08-29. This page was last edited on 25 April 2019, at 00:58 (UTC).